Thankfully there wasn’t a selection of curries on the menus at this typical Italian restaurant that had been recommended last december, in at least two of the hostels we stayed in nearby. It was an unseasonably cold Thursday in Siena, Italy. The cobbles were slippery from the early morning rain and ribbons of cold air, snaked their way through the tall alleyways, biting harshly at our ankles covered only in thin cotton socks. Winter boots were a must to stay warm and dry. It was early for an Italian lunch but the cool autumn air drove us in. Pushing the heavy wooden door frames we entered the Osteria. The room’s warmth embraced us as the waiter showed us to our weathered wooden table, in a wood panelled corner of the room. Hooks hung around us in abundance waiting to hold our damp coats. Flecked yellow placemats the texture of handmade paper, were hastily laid on the table as the menus were delivered. Tempting vapours reached our nostrils from the kitchen and we looked around to see what the other few dinners had been tempted by. They were all men. 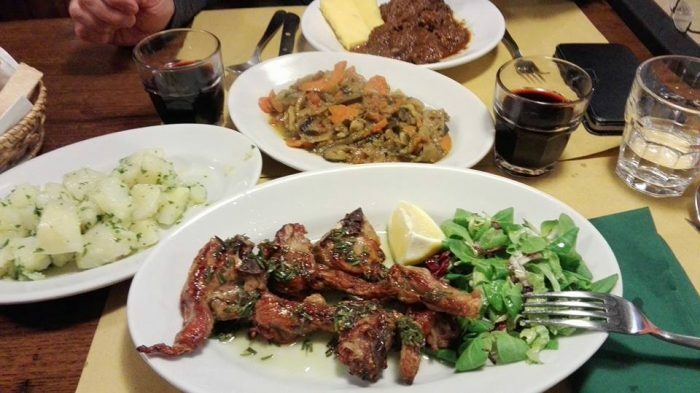 Their glasses were full with the thick red colours of the local chianti but their food was not yet in front of them. Only one man was eating. Halfway through his meal, he was taking his time to savour the flavoursome rich brown stew in front of him. His full head of hair was greying slightly. His thick, dark, bushy moustache comically protruded over his top lip, dipping into his half-full glass which he sipped between mouthfuls. He was stocky in build, with visible signs of being well fed. His shoulders relaxed, he was slightly hunched, his elbows were spread wide across the table. He was not distracted by a phone, paper or book and his posture suggested he was comfortable with his surroundings. He was seated under one of the Etruscan arches which crisscrossed the ceiling to the rear of the restaurant, near the kitchen. Ready for the next mouthful, he loaded his fork with dark green spinach from a side dish. He just chewed slowly and thoughtfully, tasting his meal with every grind of his teeth. When his plate was scraped clean by the remaining bread from a small wicker basket, he carried all that was on the table through the swinging screen towards the clatter of pots and pans. Our order was taken, our wine delivered. We eagerly soaked up the rich, red liquid with the unsalted contents of our own wicker basket. Our eyes hungrily followed the passage of Crostini laden with dark grey calves liver pate and Bruschetta loaded with fragrant basil and vine tomatoes as they were delivered to our neighbouring table. Our feast arrived not long after. Wild boar reduced to tender hunks, embedded in a sauce of tomatoes, saturated by meat juice so they were no longer red. Soft-edged boiled potatoes smothered in pungent garlic, butter and parsley. Vegetables, reduced to a glistening brown stew of sweet soft carrots, onion and courgettes, with sweet lamb fresh off the hot grill, still red near the bone, sprinkled with freshly chopped rosemary. A cool draft followed in behind the latest cluster of customers, who were shown to an adjacent table, enviously they looked on with hungry eyes.